Â Â Â Â Â Â Â Â Â Â Â Â Â Â Â The first step to digital signal processing is to convert a signal into digital data, and here the Analog to Digital Converter devices comes into action. Some of the AVR micro controllers include ADC unit in their features. This is a very useful unit for measurement related applications. The ADC used in AVR micro controllers are of successive approximation converter type. Read the Wikipedia article on SAR type ADC here. And you can read the Circuitstoday article too. & Channel number to Multiplexer. 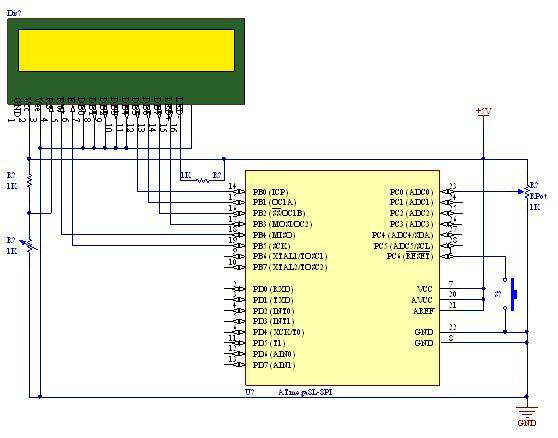 This helps to select the ADC channel to perform a conversion operation. These bits select the voltage reference for the ADC, as shown in Table below. If these bits are changed during a conversion, the change will not go in effect until this conversion is complete (ADIF in ADCSRA is set). The internal voltage reference options may not be used if an external reference voltage is being applied to the AREF pin. The value of these bits selects which analog inputs are connected to the ADC. See table below for details. If these bits are changed during a conversion, the change will not go in effect until this conversion is complete (ADIF in ADCSRA is set). In Single Conversion mode, write this bit to one to start each conversion. This first conversion performs initialization of the ADC. ADSC will read as one as long as a conversion is in progress. When the conversion is complete, it returns to zero. Writing zero to this bit has no effect. This bit is set when an ADC conversion completes and the Data Registers are updated. The ADC Conversion Complete Interrupt is executed if the ADIE bit and the I-bit in SREG are set. ADIF is cleared by writing a logical one to the flag. Beware that if doing a Read-Modify- Write on ADCSRA, a pending interrupt can be disabled. #warning "LCD configuration file already loaded. ATmega8LCDcfg.h inclusion skipped." // will not get complied. // writing charachters or both. The only tutorial remaining is TWO Wire Interfacing! I hope someday I’ll come up with it!! 🙂 Now on!! There will be projects! good day!